The content of this web site offers a life changing message, it is ripened for these last-days. Daniel 12:4 This message crosses all denominational boundaries, it is for the meek, the strong, Christian, the Agnostic, Atheist and every other walk of life. It's scope is of global proportions, every living soul for the past 2000 plus years has been affected by it's message. If you are alive and reading this today, your life has been changed and affected by the message this web site demonstrates. The Holy Bible reflects a single theme thought out it's pages, that theme is about restoration . . The entire Bible is about Our Creator calling His people back to Him. Revelation 3:20 From the earliest pages of Genesis to the closing words of Revelation, it is the intention of our Heavenly Father to share with each and every soul His plan of eternal salvation through the one and only risen Messiah. John 14:6, John 6:35-45 Please hover over Bible verses throughout the site as they are an important part of this message. To begin this journey, we need to gain the knowledge of what has taken place, what is taking place today and what is yet to happen. We must know and understand the tactful and subtle "means" in which Satan has utilized to gain his worship, but most importantly, we need to know and understand methods he has implemented and has altered to "take worship from" the One who created him. As you gain further knowledge of the historical events that have taken place over the many centuries in order to achieve these goals, it will blow you away !! "Bible prophecy is history written in advance . . History is Bible prophecy fulfilled"
How is it the principals of the heavenly bodies that had been set forth to govern mankind and the obvious, clear intentions of creation been so altered to the point there is no knowledge of it today? Before getting to far into the introduction and the intentions of this web site, it must be made perfectly clear that this site does not promote, nor does it practice Astrolatry or Astrology in any way, shape or form. We believe in the heavens created, and so for a purpose. Genesis 1:14-19 Psalms 19:1-6, Psalms 50:6, Psalms 97:6 But sadly, like the majority of good things from our Creator, all to many have been corrupted by man for his desires, in an attempt to gain dominance and power. The underlying theme, the ultimate goal of Satan is to destroy the soul, to remove from the minds of man the promise of salvation and any and all hope for eternal life after this earth has been made new. He has not achieved this overnight, his fraudulent plans have been in motion for some time now, but please know and understand these words . . he has indeed already this day achieved his goals, this is why the Bible can claims two fulfilled prophecies. 1) The Bible tells us "the whole world wondered after the beast,"
Seventh-day Saturday keeping denominations world wide believe they are exempt from the stigma of Revelation 18:4 claiming they do not wonder after the beast, they are not exempt because of there parting from the original intent of the created heavens!! Bible studies should be conducted in group settings, we are instructed to love and support one another in our journey in learning Biblical truths. Proverbs 27:17 Given that, salvation is not a group project, one must obtain/develop a personal relationship with his or her Creator. It must be up to each individual to do diligence his or her life for salvation. Yes, we do indeed believe there are many created unfallen worlds scattered throughout. This is not the first created world and it's creator just got it wrong . . This world is among many and the reason for it being in the condition it is currently in is because of Satan's fall and his desire for worship . . and "his desire for worship" are the key words, the overall theme of this web site. In every page, every thought as you explore this site and it's content, this is the one underlying, dominant presence that MUST be remembered . . It is for this reason alone that the world is in the chaos it is in, because of Satan and his desire for worship. It is our fervent prayer you will examine the evidence presented in this web site as it will have its eternal rewards. 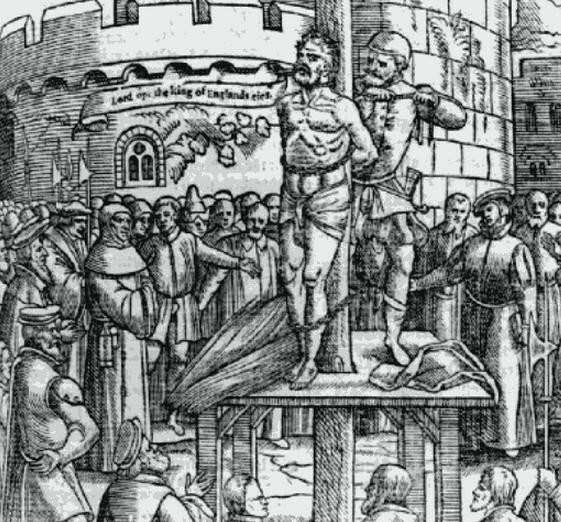 William Tyndale, just before being strangled and burned at the stake, cries out, "Lord, open the King of England's eyes", in woodcut from an early edition of Foxe's Book of Martyrs. After many decades of book burning and Christians being martyred for there beliefs, these truths have been buried under heaps of rubble of errors in translation in fulfillment of Revelation's declaration that "all the world wondered (followed) after the beast." Could any day of a counterfeit time system, i.e. the Roman Gregorian calendar, possibly be the antidote to "wondering (following) after the beast," especially if it consistently falls on a pagan Friday, Saturday, or Sunday? Should this not be cause for alarm to worship the Heavenly Father on any day, which is regularly in sync with a man-made and counterfeit calendar? Perhaps it is for this very reason that "all the world" is depicted as "wondering after the beast," rather than following the Lamb? It is no secret that the time-keeping system used in all of Israel's prophetically based Sanctuary services for 1500 years prior to the Messiah, was based entirely upon the lunisolar calendar. This is clearly taught at all Theological Seminary's. Since the only time-system the Lamb was intimately connected with, as a sacrifice for sin, was the lunisolar system, would this not be the only time-centric path available to those who seek to follow it (the Lamb) (Revelation 14:4? No other calendation was used by any of the prophets of Scripture, including Christ the Messiah, the true Lamb. He died, perfectly fulfilling the Law and its lunisolar time-centric requirement as it was defined by the Sanctuary service. This He accomplished exactly on Passover, the 14th lunar calendar date, counting from the "full" Moon. This is one of the greatest evidences that indeed He was the promised "Lamb of God that takes away the sin of the world." Had He died according to the Roman calendar and it's holidays, it would have been self-evident that He was an imposter, and not the promised One. Are we no less obliged to follow the same lunisolar time-system that our Master followed as He took on our sin as our sacrificial replacement? The Creator's units-of-time are all defined by the harmoniously integrated orchestration of the sun, moon, and stars. This includes weeks, months, days, and years, as defined in Genesis 1:14 that defines them in different words that mean the same. Every divinely ordained unit-of- time is directly beaconed by the light of the celestial bodies, including the month and the week. In contrast, Satan's Roman Gregorian calendar days and years are set solely by the sun, while His months and weeks are ordered after His own heart of rebellion, and are under the spell of an unbroken-cycle-of-successive-weeks, wholly disconnected from either the sun, moon, or stars. Over the years, much consideration has been given to the beast power's change in the divine "laws," but today, our Heavenly Father has begun to spotlight the magnitude with which His "times" have been obscured under the rubble of pagan and Papal error and distributed heavily among the various translations. In place of the Creator's revolving celestial time-piece an "artificial" wall calendar and clock have been fashioned and implemented by this beast power and are hanging on the walls of every home. The clocks display the day beginning at midnight instead of sunrise to sunset. While this human devised calendar follows only the sun, dividing the long string of 365 days into spurious months, weeks and calendar dates according to the desires of their hearts. This fraudulent calendar has a direct bearing on our Father's most holy seventh-day. Satan, in seeking worship through a counterfeit time system has stripped the minds of mankind from discerning our heavenly Father's time keeping components, the divinely appointed three part harmony of the sun, moon and stars. Working together, they signal the Creator's holy appointed and ordained feasts, quietly calling His faithful everywhere to assemble and worship at His feet. This same time system, of necessity, is beaconed among all the unfallen worlds as well, past, present, so that all the created "sons of God" can assemble for worship in unison, presenting themselves before their maker at the exact same time (Job 1:6; 2:1). It will also continue to be the only ordained time-keeping system among all created beings into all future eternity as verified by Isaiah 66:22-23. Many set their clocks and wrist watches according to their employer's time- clock, so as not to be late for work. So much more importantly, are we to set our soul temples to the rhythms of not only the earthly, but the heavenly Sanctuary's lunisolar time-piece, as divinely designed by our Creator, so as not to be late for His appointed and sacred assemblies for worship. Only in doing so, do we overtly declare who we worship as we openly acknowledge our submission and dedication to all His laws and assemble in harmony with heaven's clock. Only in this way can we become citizens of the kingdom of heaven and be counted among the redeemed and welcomed as sons and daughters of God today. The question we each must truthfully ask ourselves is- "whose time-piece or clock beckons me for each seventh-day Sabbath; is it the Pope's unbroken-cycle-of-weeks or the Creator's revolving celestial bodies?" In every age there is a new development of truth, a message of God to the people of that generation. The old truths are all essential; new truth is not independent of the old, but an unfolding of it. It is only as the old truths are understood that we can comprehend the new. When Christ desired to open to His disciples the truth of His resurrection, He began "at Moses and all the prophets" and "expounded unto them in all the scriptures the things concerning Himself." Luke 24:27. But it is the light which shines in the fresh unfolding of truth that glorifies the old. He who rejects or neglects the new does not really possess the old. For him it loses its vital power and becomes but a lifeless form. Christ's Object Lessons, 127. The old truths will be presented, but they will be seen in a new light. There will be a new perception of truth, a clearness and a power that all will discern. Those who have the privilege of sitting under such a ministry will, if susceptible to the Holy Spirit's influence, feel the energizing power of a new life. The fire of God's love will be kindled within them. Their perceptive faculties will be quickened to discern the beauty and majesty of truth. Christ's Object Lessons, 130. In Scripture there is no "thus saith the Lord" that Saturday is the Sabbath. Neither is there an "it is written" that the Creator of the sun, moon and stars, has ever recognized an unbroken-cycle-of-weeks since creation. In addition, while the Heavenly Father revealed to Ellen White that the seventh-day was the Sabbath, He never revealed, nor declared that "Saturday" was the seventh-day -- not in a dream, not in a vision, and neither in a "thus saith the Lord," or an "it is written." Rather, these were assumptions based, on a belief, that the Roman wall calendar is in harmony with the calendar in Scripture. Our heavenly Father allowed this to continue to fulfill the times of the Gentiles. But the "loud cry" is now going forth, a time of "new light," when the remnant will awake and "proclaim the Sabbath and all time, more fully." 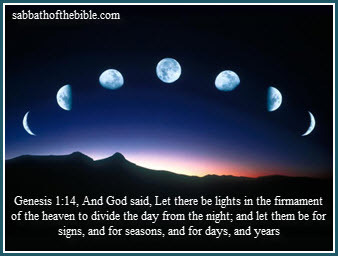 It was the Heavenly Father's intention that this final message of truth was to spotlight the lost and forgotten lunisolar time-keeping system of the Creator, defining His true Sabbath to be beaconed by the perpetual "full" New Moons, rather than a man-made wall calendar. Shockingly, neither Friday, Saturday nor Sunday are the Creator's true seventh-day Sabbath of the Bible. Consequently, Saturday as the Sabbath has simply never qualified as an "old truth." Saturday had never been the seventh-day of any calendar until the year A.D. 324, when Constantine moved Saturday from the first day of an eight-day pagan week, into the position of the seventh-day of a uniquely new pagan seven-day week, that cycled without end. Many good souls believe that it is mere coincidence that an unbroken-cycle-of-weeks since Creation, falls on a Papal Saturday. Remarkably, Scripture is profoundly silent with regards to an unbroken-cycle-of-weeks since creation. Strikingly, the Papacy's greatest secret, and keystone of her power, is its knowledge that this profound deception is not a mysterious coincidence. Dear friend, I challenge you to prayerfully consider the weight of Scriptural evidence as you search through this Biblically based website, as for buried treasure. than familiar is synonymous with right. The Biblical and historical evidence presented on this site concerning how man, mainly Rome has changed our Creators "times and laws" is overwhelming, Daniel 7:25. The reason for these changes is demonstrated from the Bible, Isaiah 14:12-14. Because of the fall of Satan and his desire for worship, Matthew 4:9 it is Satan, working through Rome who has orchestrated and implemented the removal of all Biblical feast days, made many changes to the Ten Commandments, and has changed times from what they were at creation John 11:9 and too the calendar man follows in order to achieve his goals of removing worship from our Creator.